An extremely modern analog compressor that combines the versatility of a plugin and the soul of vintage hardware. Tweaker takes compression to the next level. Its vintage, discrete VCA and bespoke detector are married to envelope-pushing controls that allow this box to be whatever you want it to be: smooth & polished or dark & filthy, subtle & delicate or fierce & explosive. To achieve such extremes, Tweaker stretches and expands the range and function of its traditional compressor controls, then breaks new ground with a radical and innovative ‘Sidechain Shaper’ section. 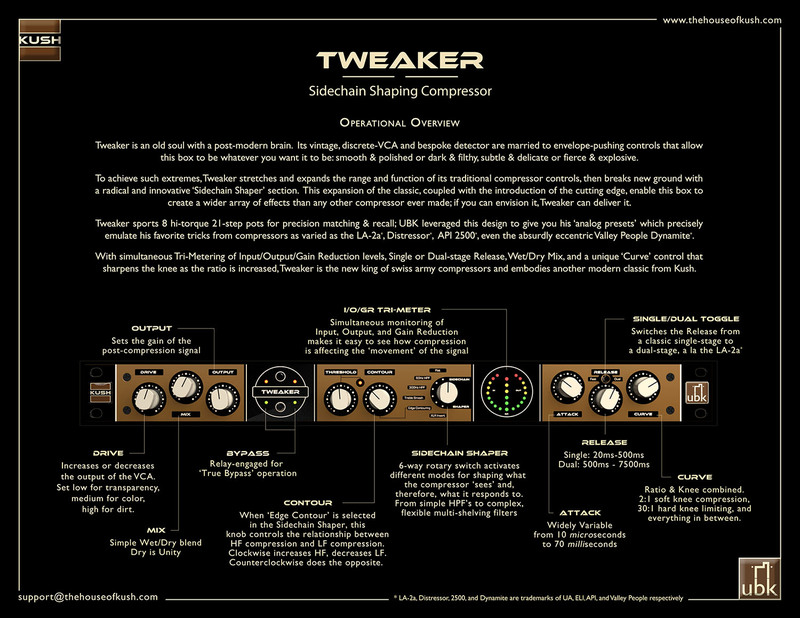 With simultaneous Tri-Metering™ of Input/Output/Gain Reduction levels, Single or Dual-stage Release, Wet/Dry Mix, and a unique ‘Curve’ control that sharpens the knee as the ratio is increased, Tweaker is an old soul with a post-modern brain. This expansion of the classic, coupled with the introduction of the cutting edge, enable this box to create a wider array of effects than any other compressor in existence. Whatever your vision, Tweaker delivers.